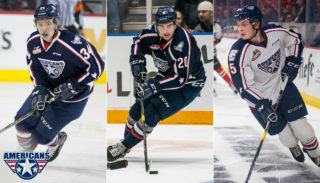 KENNEWICK, WA – They are called ‘character wins’ and, after the way things have been going for the Americans, they earned a big one Tuesday night. 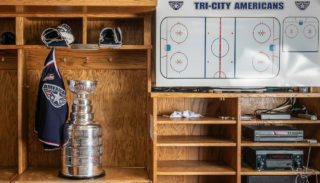 Down 6-1 at the midway point of the game, the Tri-City Americans (37-21-2-2, 78 pts) rallied to within one, before eventually falling short in the final minutes, as the visiting Portland Winterhawks (43-17-0-3, 89 pts) took home a 6-5 win in front of 3,605 fans at the Toyota Center. With the win, the ‘Hawks won for the first time in Kennewick since October 31, 2008, a span of 11 straight trips. Meanwhile, Tri-City has now dropped six of their last seven games, including four of their last five at home. 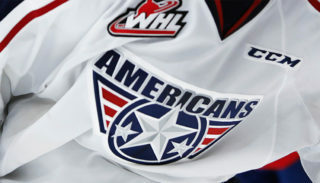 However, the Americans wrapped up the regular season with a 5-4 edge in the season series vs. Portland. Starting Tuesday’s game with just 16 healthy forwards, and many big names still out of the line-up, the banged up Americans fell behind in the early goings. At the 8:31 mark of the first period, and on the power play, Brad Ross notched his 24th goal of the season off a Ryan Johansen rebound. Then, 1:29 later, Sven Bartschi collected his 30th after he put back a Craig Cunningham shot. Finally, with 5:33 left in the period, Bartschi sent in Cunningham, who beat Tri-City starter Chris Driedger with a backhand, to make it a 3-0 game. After several near misses earlier in the period, though, Carter Ashton connected with 8.9 seconds remaining to get the Americans on the board headed into the first break. But, the second period saw Portland take advantage of some defensive miscues by Tri-City, as they scored another three goals to make it a 6-1 game. At the 6:01 mark, Nino Niederreiter scored his first of two goals on the night after he connected on a 2-on-1 breakaway with Bartschi. Just 1:55 later, Niederreiter scored again, this time from inside the slot. Then, with 6:12 left in the second, and on the power play, Joe Morrow fired a blast from the left point that beat Driedger low on the stick side. Similar to the first period, however, Tri-City got another late-period goal to take some momentum into the locker room. With 20 seconds left in the period, Connor Rankin found daylight over the glove of Mac Carruth, pulling the Americans to within four headed into the intermission. The third period, though, saw the Americans play with a spark not often seen as of late. Tri-City wound up outshooting the ‘Hawks 16 to 7 over the final 20 minutes, as they made a frantic push towards tying the game. Just 1:14 into the third, and on the power play, Tyler Schmidt fed a two-seam pass to Brendan Shinnimin, who nailed a backhander, backdoor on Carruth, to make it a 6-3 game. Only 2:02 later, Schmidt made another nice pass, as this one sent David Conrad in on a breakaway. Conrad eventually slipped a backhander between the pads of Carruth to make it a two-goal game. With the hometown faithful now fully behind their comeback effort, the Americans continued to buzz around the Portland net. But, as time ticked away, Tri-City coach Jim Hiller felt he had to take a chance. With 3:16 left in regulation, and following a Portland icing, Winterhawks coach Mike Johnston called timeout. With the ensuing face-off in the Portland end, Hiller opted to pull Driedger for the extra attacker while the teams were set to play four-aside. The gamble worked, as Ashton won the draw and pushed the puck out to Kruise Reddick at the point. From there, Reddick fired a wrist shot past Carruth to make it a 6-5 game. Hiller gambled again, sensing the tying goal was well within reach, but the Americans could not come up with the equalizer down the stretch. As difficult as it was for a struggling Tri-City team to not complete the comeback, the loss was somewhat diluted by the 49-shot, 5-goal output. Carruth, who finished with 44 saves, held on for his 30th win of the season. Meanwhile, Driedger, who collected 29 saves on 35 shots, fell to 5-6-0-1 on the year. Tri-City finished the night 2-for-7 on the power play, while Portland went 2-for-3 on the man-advantage. 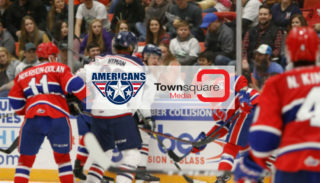 The Americans will now look to carry some of Tuesday’s momentum into their next contest, set for Friday, March 4 vs. the Everett Silvertips (27-27-5-4). Game time is 7:05 p.m. at the Toyota Center. The ‘Tips, who will have had nearly a full week off, come in having lost two straight but were winners in their last meeting with Tri-City, a 3-2 win on Feb. 22. Tickets are available through all Ticketmaster outlets, including online at ticketmaster.com, the Toyota Center box office, or all Fred Meyer outlets. The game will also be broadcast live on NewsTalk 870 AM starting with the Sterling Savings Bank Warm-up Show at 6:45 p.m.